← Life is Good! Really….Life is Good. Thank you! Gardening is definitely healing. To touch the earth with your hands, to build something from nothing, to restore the earth and promote growth gives the human spirit a much needed immune system boost! Its been proven, that if we find something that motivates our soul, we find that inner peace that brings with it acceptance and the wisdom of peace. Isn’t that what we are all searching for after cancer? Some space, some place where there is an escape from the everyday repeat of the fact that we have been ill, are ill, or may get ill again? So I have decided that I will embark upon this journey to fix up my little house and large yard. When I started out, two years ago, the yard was quite wild. For a big corner lot, it was mostly covered in ivy, which in itself is quite nice to look at and doesn’t require much maintenance or updating. However, after awhile it gets boring. So I decided to add a few items, and trim a few items. Enter the workers that I hired to trim the bushes. Before embarking upon such an experiment, make sure the person you are speaking to understands exactly what you want done. Unfortunately, I did not communicate correctly what it is was that I wanted done to the three heather plants in the front yard. I assumed he knew what a trim meant. Let me look up trim ….recortar is the word in Spanish that I used. It can be trim, cut back, lop off, remove ….oops. Okay, so he cut back and dug out the roots of my heather bushes and removed them. Now I was left with a big hole in the middle of an entire side yard of ivy. That was a year ago. The hole is still empty. So what to put in the empty spot in my life. Whoops…yard not life! Interesting how God always replaces something when something is lost. However, back to my ivy spot, I have decided to recycle some old tires. Everything about my house is recycled. I don’t know why I took on this effort at this time in my life. It is sort of like my life, it’s being recycled. I am taking the old body and trying to make something out of what is left over. The garden has an empty spot. Many neighbors comment. They wonder what is coming next, or if anything is coming at all. Since I am the first person in the community that you see as you enter, I do feel a great responsibility to replace it with something beautiful. We are now in month number nine of me thinking about what should replace the heather. Its all so applicable in my life. If you only knew the story of the missing Heather. What will I replace the missing Heather with? Old tires? 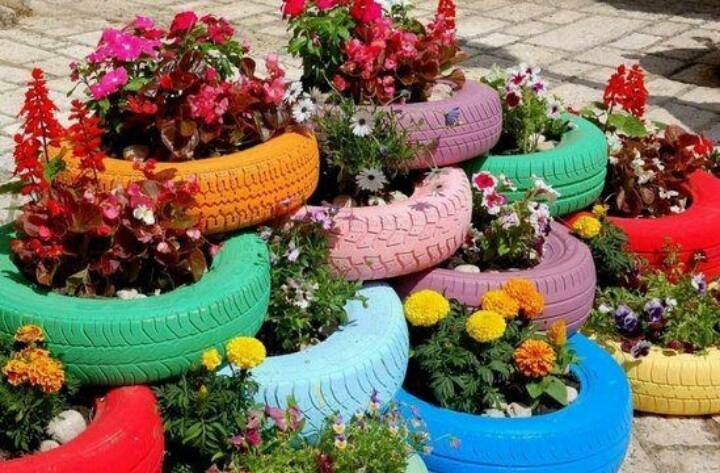 Painted old tires? Perhaps. Flowers, perhaps, but they are fleeting….they would die down in the winter and look again, like an empty spot. Sort of like relationships, don’t you think? Seasonal. I like the tire idea. So I got some used tires from a friends daughter-in-law. They are not to big, but this morning I will spray paint them. Sounds fun? Me and my paint! For those of you that don’t know me, I like to paint everything. I do it all the time. Its part of me. Painting has become what I do since I had cancer. I clean things up. I make them new. Its who I am. Who are you? Do you know who you are? Am I painting over the layers of my life and moving on? Try it sometime, it’s wonderful. Next topic, Have you ever given away any ‘eggs’ or ‘sperm’? Did you wonder where they went? Have they ever showed up at your door? Do any of you think this might be an interesting topic? Let me know! This entry was posted in Uncategorized and tagged breast cancer, Gardening, motivation, recovery, spirituality, survivor. Bookmark the permalink.